BMW’s X3 was the company’s second shot at the burgeoning crossover market, and was a pretty successful sophomore effort. Today’s Nice Price or Crack Pipe X3 comes with a rare manual gearbox, but could that make you take a second glance at its price? A few years ago, back in my advertising agency days, my shop pitched to Suzuki a viral campaign for the launch of the SX4. We didn’t get the gig, but based on the experience of visiting their headquarters I got the impression that Suzuki Auto wasn’t going to be around very long, so it really didn’t matter. At just $1,950, even those minor issues could be overlooked making the trucklet pretty much a slam dunk, and earning it a decisive 90 percent Nice Price win. Consider this however—what if you really needed a car that spun all four wheels when needed? What if, additionally, you needed a bit fewer miles under the belt? And finally, what if whet you really wanted was a car from a company that is still kicking it here in the U.S., making parts and service less of a headache? 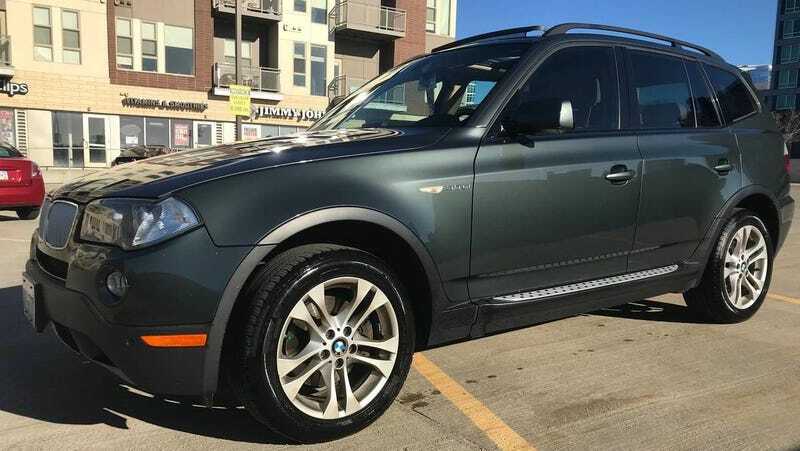 There are many cars and light trucks that might meet those criteria, but only one is this 2008 BMW X3 3.0si. BMW has embraced the crossover category with a fervor few other companies have been able to match. Their first, the X5 benefitted from the company’s ownership of Land Rover at the time, and shared certain features with that British marque’s mainstay products. The X3 was BMW’s next effort and took all the learning from the X5 model and applied it to a slightly smaller, albeit a bit more Bangled design. The E83 X3 took its base from the E46 330xi 3-series, upon which was added a tall five-door wagon body. Over the years the model has proven successful enough, and is now on its third generation. I’m going to go out on a limb here and suggest that this one, the first, is the best looking of the bunch. With Highland Green Metallic paint over a beige-forward interior, this one also sports a pretty appealing color combination. Both exterior and interior seem to present well for a decade-plus old car, although there are some issues with both. On the outside, the factory alloys exhibit a bit of minor curb rash, while inside there just seems to be an overall need of a detailing to make everything right as rain. Powering this X3 is BMW’s lovely N52B30 DOHC inline six. That 2995 cc mill pumped out 260 horsepower from the factory. Here it’s paired with a rarely optioned six-speed stick. Along with that, the car comes with the sport activity package which admittedly sounds tiring. It also rocks a panoramic moonroof and pretty much power everything. All four seats and the steering wheel are heated for all your cold weather comfort while enjoying those packaged activities. Overall mileage is said to be 152,886 and the ad notes that the clutch was renewed a little less than 20K ago. Brakes have also been recently gone through and the Michelin meats have about 15K on them. This seems a pretty compelling package, and similarly kitted to yesterday’s Suzuki, only with more of everything to offer. You might then expect it to cost more than that Grand Vitara and you would be right. The asking price is $5,950, but there’s a fly in that ointment. The seller notes in the ad of there being a lien against the car. Why is that? Who knows, maybe he’s still paying off that clutch job. Perhaps the car was used as collateral against some other sort of loan. Regardless, any potential buyer will need to account for having to deal with the lien holder, either through the seller or around him, in the consideration of this car. Let’s consider it right now. What do you think, does $5,950 seem like a decent price for this rare six-speed X3 as it’s presented? Or, does the title issue have you saying you’re going to have to “lien” no? 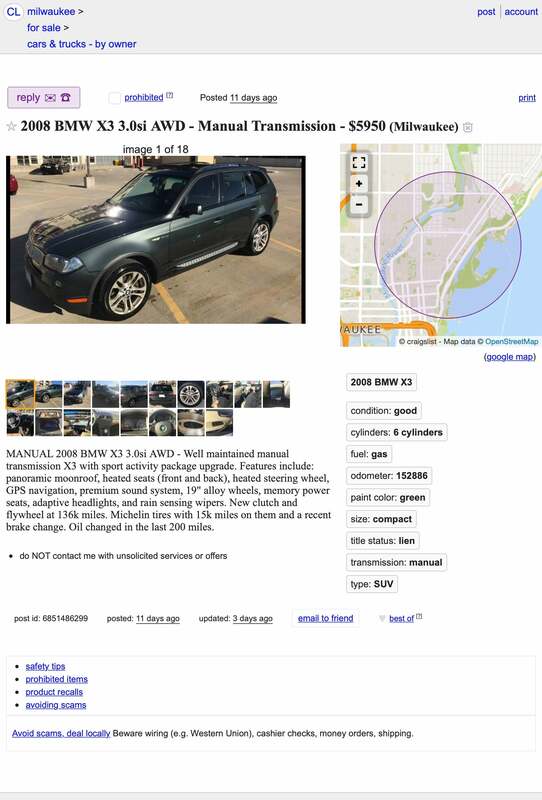 Milwaukee, WI Craigslist, or go here if the ad disappears. H/T to Picky Boceefus for the hookup!